I was flipping through Jonathan Adler on Happy Chic Colors, which I got for my birthday, and fell in love with this dining area. 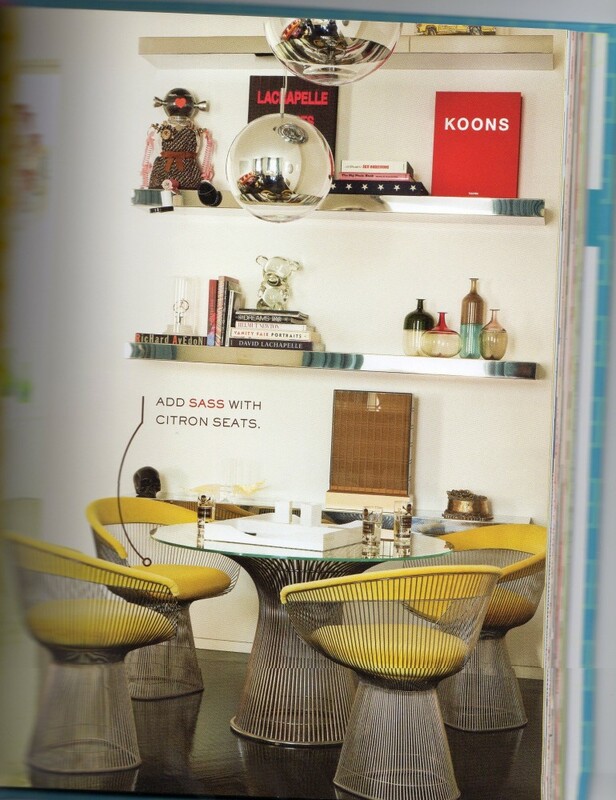 I’m a big fan of the metallic shelves and orb light fixtures, plus a splash of citron gets me every time. It’s a really great book with tons of interior inspiration. Snag a copy of the book here. 6 Responses to "Happy Chic." those chairs are so mod and chic – love! I have Happy Chic Accessorizing. Must get the other. Is this your scan? Love the way it came out. I for sure thought it was some crazy cool photography. It is my scan, just got a scanner and I’m so excited about it! I have both his books I bought for $5!! I love them! !